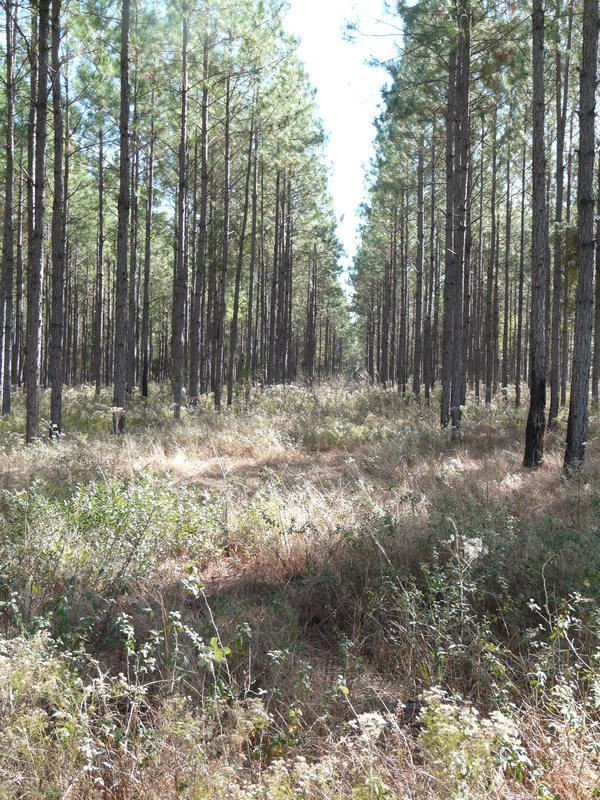 This is a stand of improved slash pines planted in 1995 and were 4th row thinned about three years ago. Last week, I made a blog post about Japanese Fern and Chinese Privet. 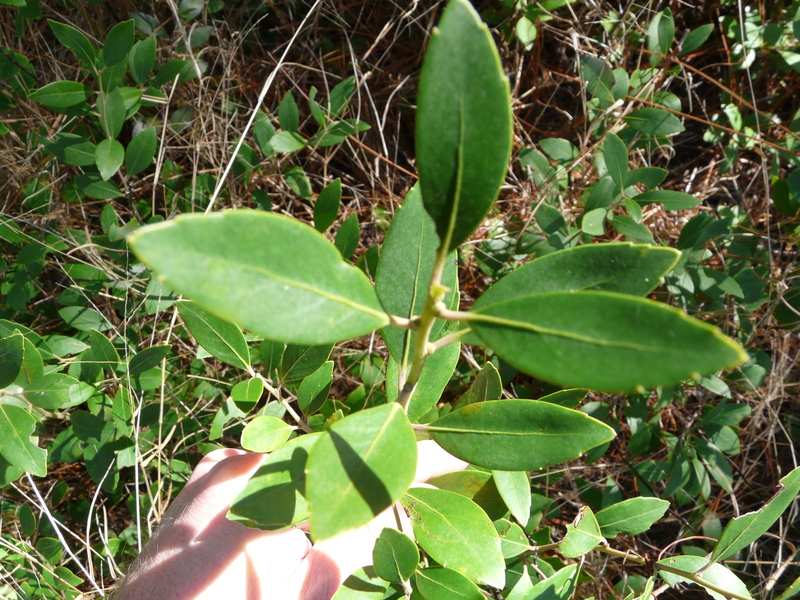 Here is a native shrub found in the Coastal Plain region – Inkberry (Illex glabara). 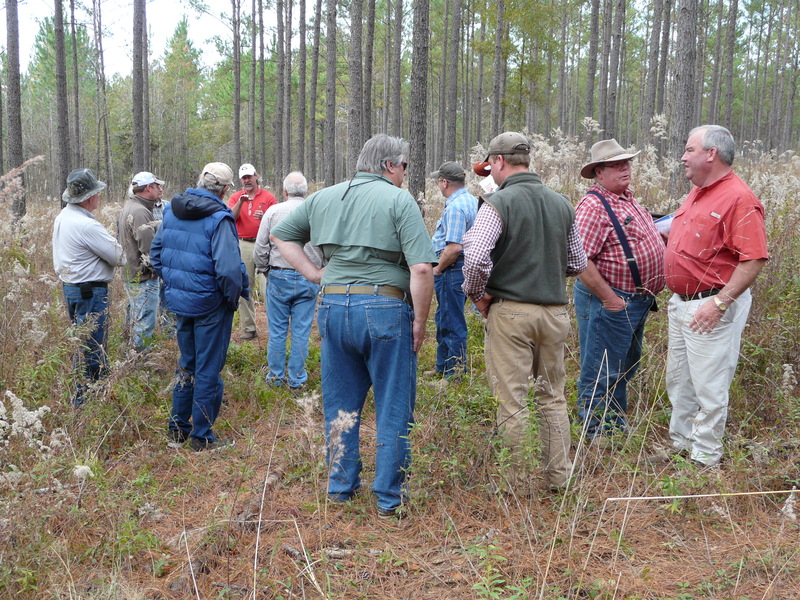 UGA Extension Forestry Weed Specialist Dr. David Moorhead says that burning will keep it small in stature but it is adapted to fire. A herbicide treatment using tricolpyr would be helpful. This would also will be fine without harming grasses. 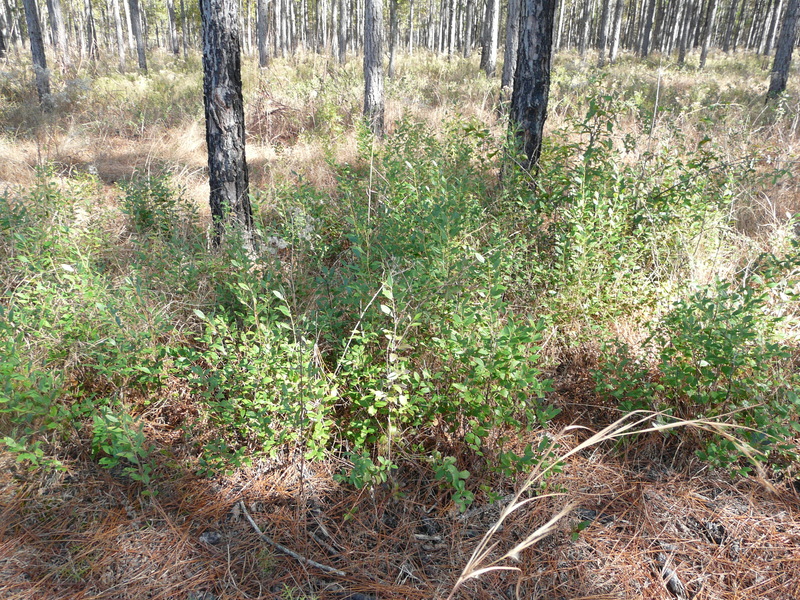 For more information on forest weed control, visit the Center For Invasive Species website. Wheat is now coming up and is in the seedling stage. The Feekes scale of growth stages is one of the most common scales. 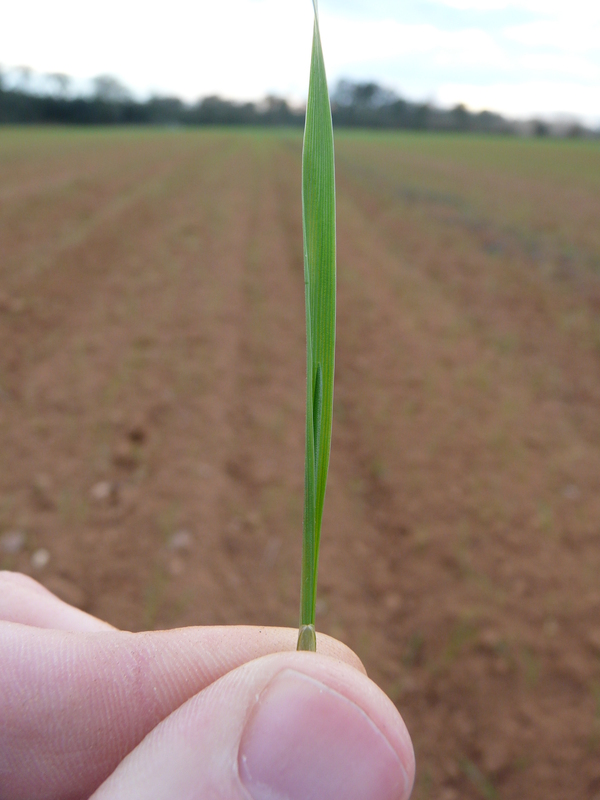 In the 1.0 seedling emergence stage, the number of leaves present on the first shoot can be designated with a decimal. So, this would be stage 1.1 – a shingle shoot with one unfolded leaf. The most significant factor in developing a good yield is stand establishment. This field was broadcasted at 120 lbs/seed acre. 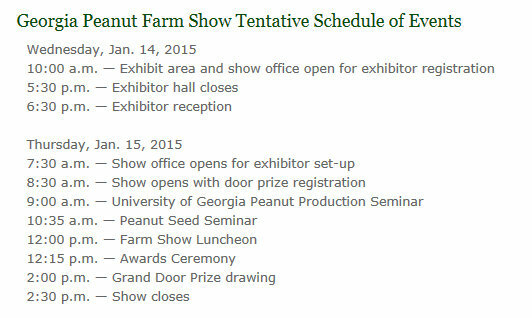 When broadcasting, UGA Extension Grain Agronomist Dr. Dewey Lee advisese that we aim for 40-45 seeds per square foot. Our overall gaol is 30-35 plants per square foot. 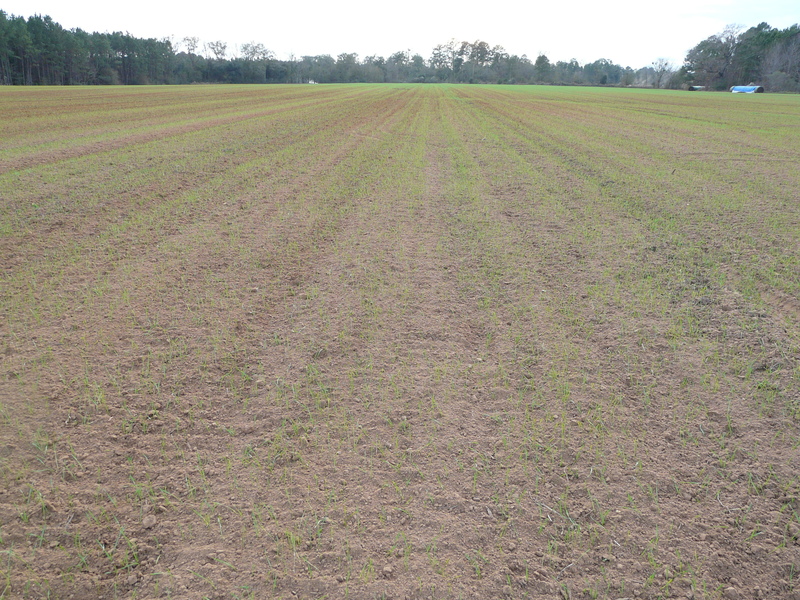 Right now, wheat planted behind cotton and peanuts looks to have anywhere from 20 to 35 plants per square foot. Some plants are still coming up however. Because of late planting date, we can go a little longer before we have to put out post-emergent herbicides. Generally, this is done around Christmas. Also, we will need to start scouting for aphids and Hessian flies in a couple more weeks. 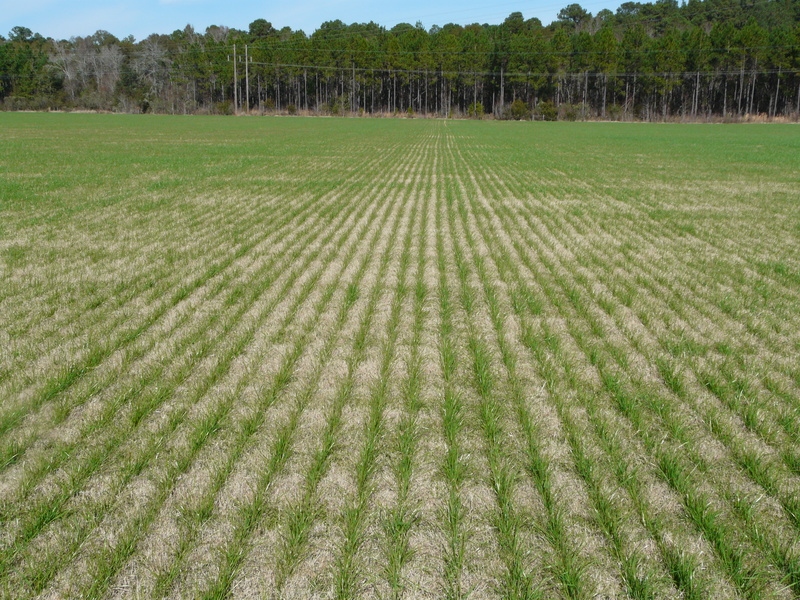 Harmony is safe on early growth stage, but we want tillers before using 2,4-D. Terrell County Ag Agent Nick McGhee posted good information on Making Wheat Herbicide Applications which includes Dr. Culpepper’s recomendaditon print out. Dr. David Moorhead gives presentation on weed control. 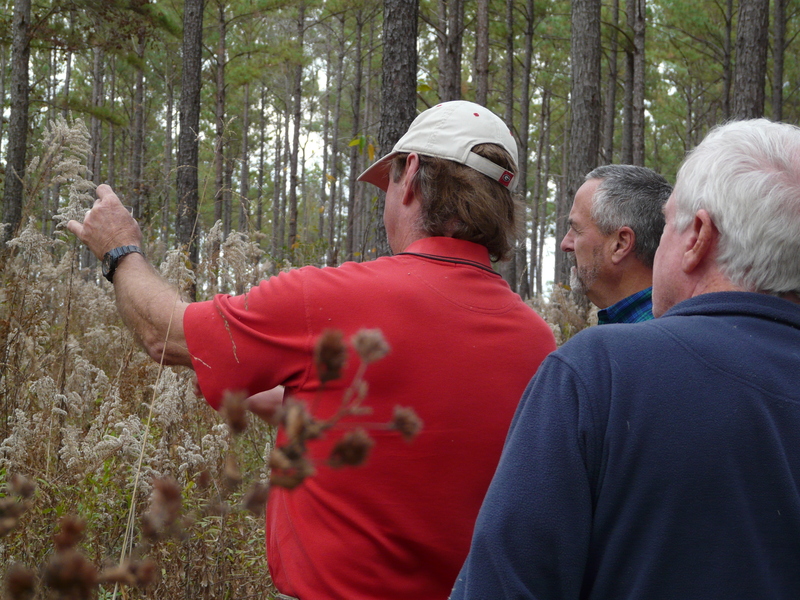 Dr. David Dickens discusses forest productivity. Dr. Ben Jackson talks about woods road construction and importance of grade and dip spacing. 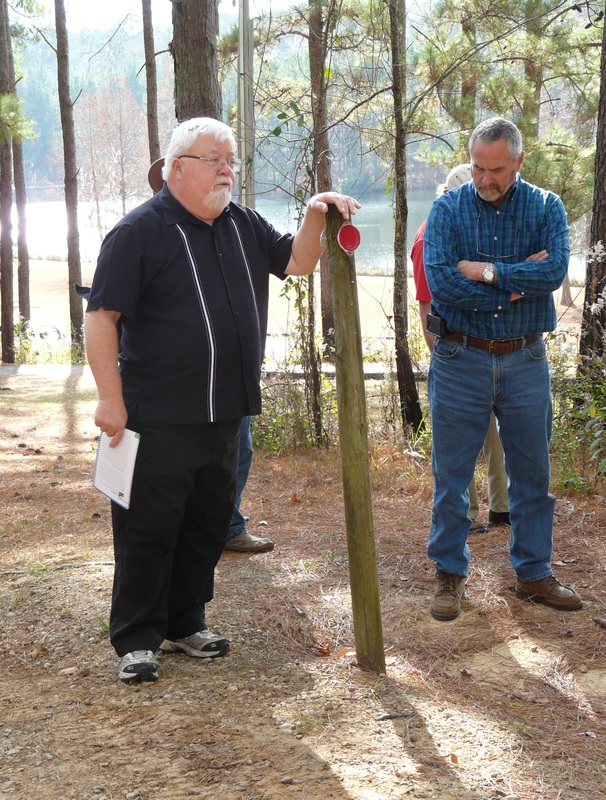 Dr. Dickens shows how to use the glass wedge prism to determine if trees are ‘in’ or ‘out’ of variable radius for calculating thinning. 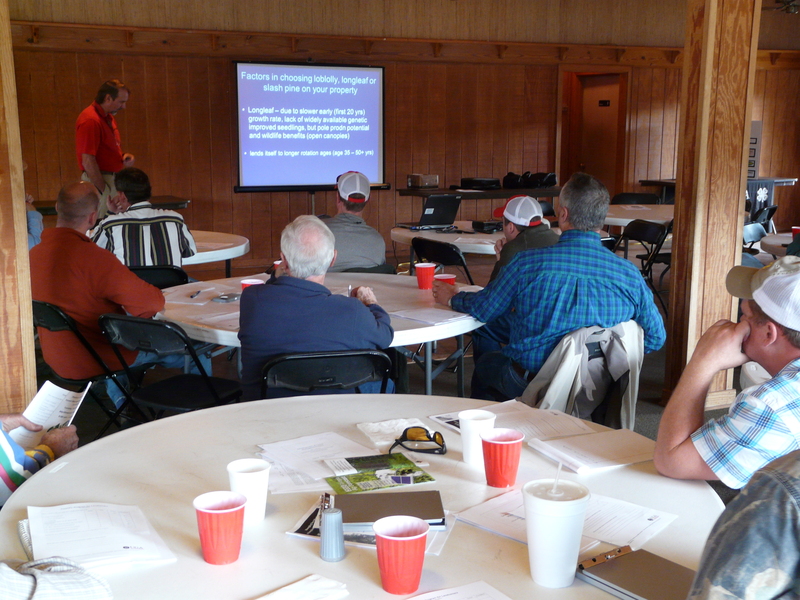 Dr. Moorhead discusses weed control options and Dr. Dickens talks about thinning considerations with attendees. If you were unable to attend, we have a few handouts available on the front table in the office relating to tax tips for landowners, developing forest management plans, and a template for management plans. Here are the results from the NexGen cotton variety trial we did with UGA Extension Cotton Agronomist Dr. Guy Collins. Thanks to grower Mat Thompson for collaborating with us on the trial. We planted on May 15th and harvested on October 23rd. Below is yield data from the trial and also a graph showing statistical data. It is important to remember that bars with the same letter indicate no statistical difference between particular lint yields. 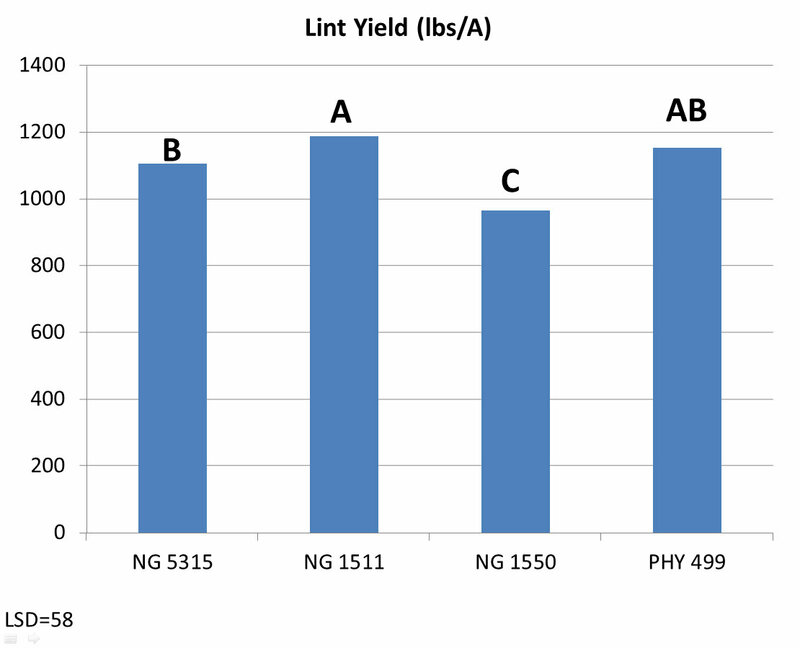 Mean differences from those lint yields result from field variability. We were out looking at some forages planted for grazing and hay yesterday. Here is some Nelson ryegrass drilled with Crimson clover into a dormant bermudagrass pasture. These fields are coming along well with little to no issues. With clover, the seed depth is so shallow, you basically just set the seed on the ground since settings are not that shallow. 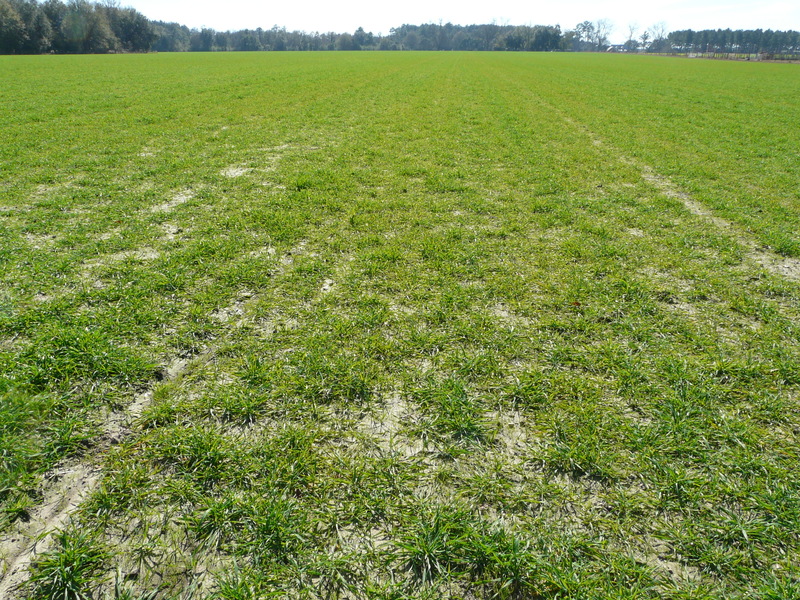 When broadcasting clover, seed depth is usually not an issue onto dormant warm season sod. If drilling, you have to make sure the seeds are not planted more than ¼ – ½ inches deep. Much of the clover is coming up but some is coming up in more spots than others. The only issue so far is weeds. We have mostly chickweed, but also carolia geranium too. 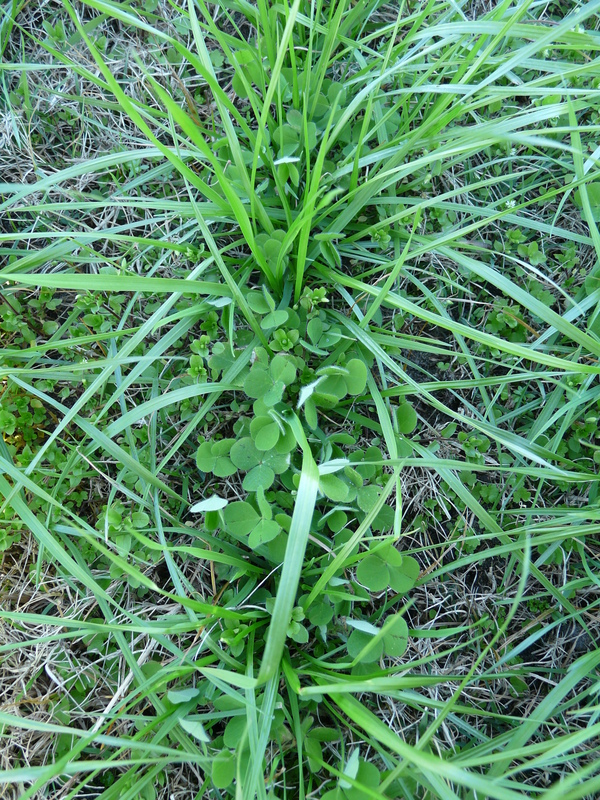 We wondered about a pest emergent herbicide, but since clover is still in seedling stage, UGA Extension Weed Scientist Dr. Patrick McCullough says no herbicides are safe enough on seedling clover. With such few options of herbicides on clover, we were worried about ryegrass. Dr. McCullough says ryegrass would be tolerant, but selective weed control with clover is difficult enough with established clover. In another field oats has been planted for grazing. This field has been typical of some issues in the county this year. Planted around October 20th, we went through such a dry spell and had a hard time getting a stand. We wondered about fertility being an issue since oats are less tolerable to pH below 6.0 then rye. Even with grid soil sampling, you can see small spots of low pH. Those spots were not evident here, just bad stand. In the very coverer of the field, the stand is much better. It was clear that low spot is much wetter and seed was able to germinate.